Boris Mikhailov’s series The Wedding stands out in relief from the 413 images it accompanies in the photographer’s work Case History. This epic body of work documents the bleak socio-political landscape of his hometown Kharkiv, Ukraine, from 1997-98, after the collapse of the Soviet Union. 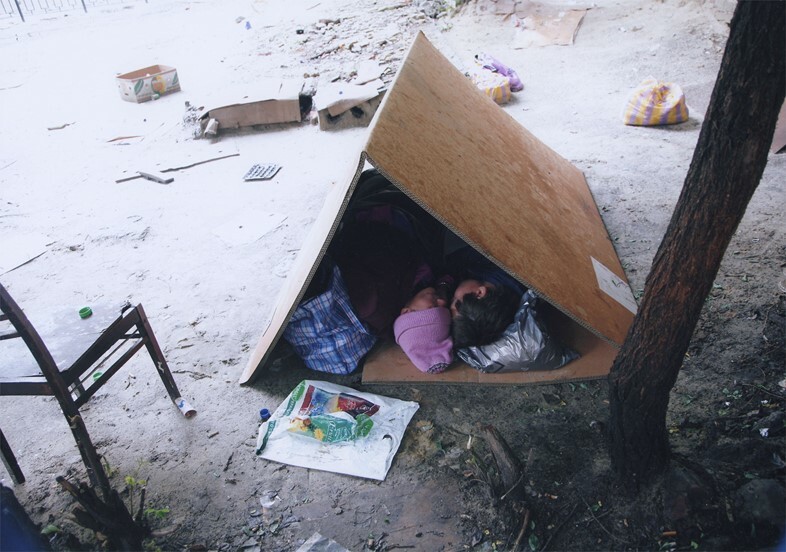 Soaring inflation and dwindling energy resources left swathes of the middle and working classes in devastating poverty and Mikhailov set out to document the lives of the “bomzhes” (the homeless) the only way he knew how – with his camera. While it’s life on the fringe that concerns both this series and its placement, there’s also a sense of universality that courses through these images. “I seldom came across a homeless woman. But [even in these circumstances] they were a couple – even here they lived somehow in the same way. They continue like normal human beings. They walk down the road, they hold hands together – it’s radiant.” It’s this element of joy juxtaposed with adversity that invites the viewer to consider their own proximity to life lived on the fringe. Another Kind of Life: Photography on the Margins is on display at Barbican Art Gallery, London, until 27 May 2018.